Spending a few days wandering around Moscow is a complete voyeuristic thrill. As with all large capital cities, there is a bonanza of things to see and do. Yes yes, of course one has to walk into Red Square, see the famous technicolor church of St Basils, and stroll under the shiny gold onion domes of the Kremlin. But these would have to wait. The most exciting thing on my itinerary had to be first. I took the glorious Moscow Subway (much more on that in a separate post) to Red Square and strolled south along the Moscow River. But before I got there, I was shocked to find a massive pirate ship in the middle of the river! 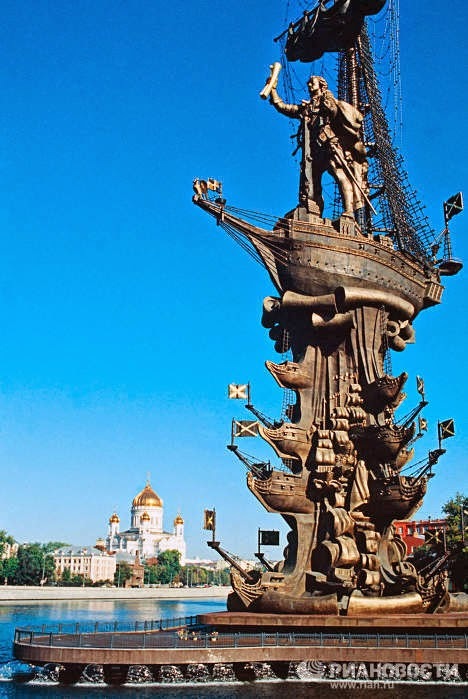 "The statue is allegedly based on a design [by Zurab Tsereteli] originally intended to commemorate the 500th anniversary of the first voyage ofChristopher Columbus in 1992. When an American customer for the project could not be found, it was repurposed with a Russian theme. Tsereteli denies this story. A separate, equally colossal statue of Columbus by the same designer eventually wound up in Puerto Rico after being rejected by various US cities, but, as of 2011, remains disassembled." 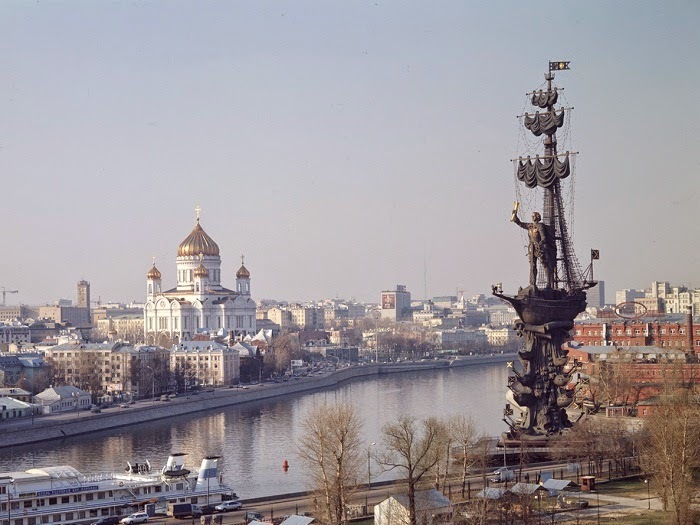 So.. a Russian architect in bed with the Moscow politicians decided that he would take a ginormous, freaky Christopher Columbus statue, change the head on top to look like Peter, and resell it to Moscow. I'm sorry but that is hilarious. Anyway, after placing my eyeballs back into my head, I neared my target: the awesome Fallen Monument Park. At the entrance you are greeted with an array of whimsical statues -- old skinny men, girls, cartoonish animals, you name it. But I wasn't here for these. Finally after wandering around a bit, in a quiet corner I hit the jackpot: the greatest collection of old Stalin and Lenin statues in all the world! Stalin looking serious, Lenin grimacing in deep thought, Stalin smiling menacingly. Perhaps my favorite was the now headless Stalin body pointing boldly to ... a shrubbery. Oh Stalin! What were you pointing to back in your days of glory?! After the wall came down and the USSR crumbled, a lot of these statues were pulled down. And it seems quite a few found there way to this pretty sculpture garden along the Moscow river. Being an American strolling next to these bearded kings of Communism in the heart of Russia has a certain thrill--I felt like I was breaking some rules just being here. Cmon quick! Which is Lenin, which is Stalin?! Communist schadenfreude tank filled, it was time to hit the highlights. 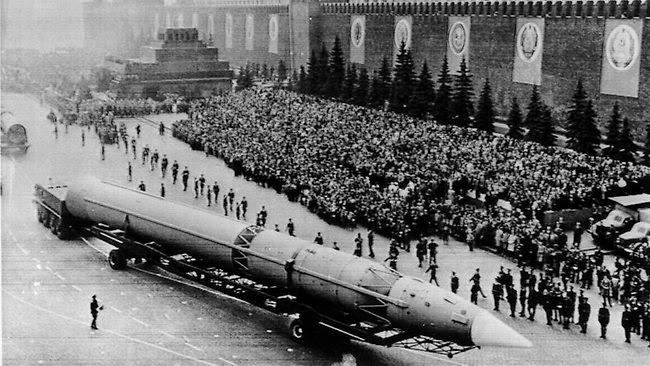 I immediately thought of one of those old photos of ICBMs being paraded right here in this very spot. A missile designed to obliterate America. And here was I, an American, warmly welcomed. It was all very surreal. Down the street, yes, there it was! The candy-colored swirls of St Basils! Wow. I couldn't wait to explore it up close, but first things first. I had to go see me a pickled Soviet leader!! I waltzed up to the Tomb and was surprised not to find a line. Huh. And then I saw it: a sign in English stating that the tomb was closed on Sundays. I checked my watch. It said Sunday. Aaaaaaaaaaaaaaaarrrrrrrrrrrrrgggggggh!!!!!!!!!!!!! Heartbreak. I couldn't believe it. I had already missed my chance to see pickled Mao in Beijing. I had arrived on a Monday, the one day it was closed. And now I would miss pickled Lenin for arriving on a Sunday. Something inside me died that moment. Or perhaps it was just mummified. Hard to say.